Here at Southern Indiana Hardwoods, we use all natural hardwoods from Indiana. 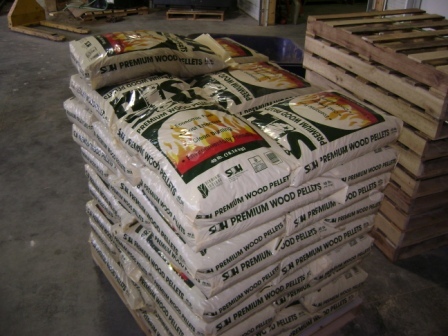 Our pellets are comprised of material taken from the log and freshly sawn lumber. There are no glues, stains, or any other wood finishing chemicals or preservatives in our raw material. All Drying and Pellet Processes are PLC controlled with multiple Human Machine Interfaces (HMI) throughout the process. Our slab wood and board cut-off pieces run through a chipper and are screened with 1 �� holes before being conveyed on a concrete pad to await the drying process. Sawdust from all of our sawing processes is saved and separated to be dried. We load the chips into a hopper that has a variable discharge rate based on the moisture content of our dried material. This hopper feeds a 300 HP Hammermill which grinds the chips into a fine fiber, sized to make wood pellets. Afterwards, the Hammermill material enters a Triple Pass Dryer fueled by a dual burner wood burning process heater, outputting up to 2.2 million BTU/hour per burner. The drum dryer will increase and decrease speed in response to the moisture content to be able to quickly adapt to the different drying characteristics of different species. We are targeting a 10-12% moisture content in our dry product, and we use a moisture meter to take samples at four times a minute to ensure a quick adjustment to the feed hopper and drum dryer. All dried material is then stored in a silo to be made into wood pellets. 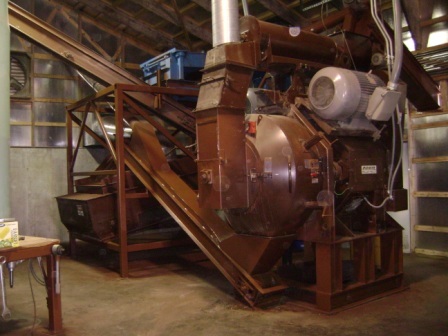 The wood pelletizing process begins with the dried material coming into a conditioner where corn oil is sprayed and mixed with the fiber to help reduce heat and lubricate the die surfaces as material is forced through it. When the pellet is extruded from the die, it will pass by three sets of pellet breakers, each containing three breakers. After being broken, pellets will be conveyed through a second breaking process as a last measure to ensure no longs make it in the final product. From this point, pellets are cooled and screened to eliminate fines, which return to the conditioner to be run through again. Pellets are then stored in a bulk bin to wait to be bagged. Before being bagged, all pellets dump across a screen hooked up to a dust collector to reduce any fines and dust created in the bulk bin. We are continuously running tests to verify our moisture content in our final product with results ranging from 5-6%. We do a box test to verify our bulk density is a least 40lbs/cu.ft. An additional test is in our facility; we have a pellet stove and continually test our product to ensure a clean burn and trouble free operation. Click here to become a dealer today!